A Torque Limiter is used to limit the torque being transmitted through a drive system by sliding when the torque exceeds the pre-set value. Once the over-loading is removed, the device will allow the drive to start working again automatically. The unit is used to prevent damaging the equipment and avoiding costly break downs. 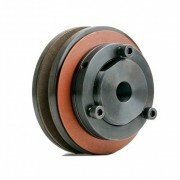 The Torque Limiter operates through a spring, mounted upon the friction facing. The sliding torque can be pre-set by adjusting the nut. Torq-Tenders are positive drive couplings which provide accurate overload protection in many mechanical power transmission systems. When a jam-up or excess overload occurs, Torq-Tenders disengage motor drives. 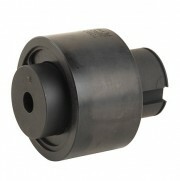 Their effective, versatile design, protect your drive train, motor, and entire system. When load exceeds the rating determined by precision tempered torque springs, the unit's drive key pivots out of a slot to disengage the coupling. Once the overload is removed and speed reduced, the Torq-Tender resets itself automatically. All models are available with actuating pins or actuating disc, which will automatically signal an overload warning or shut the machine systems down entirely. H-TLC operates on the same basic principle as Torq-Tender, except the torque setting is adjustable and it uses polymer materials in its major components to resist corrosion. 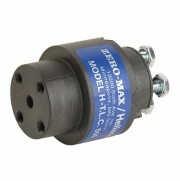 If operating conditions require periodic changes in torque settings, the H-TLC gives you that ability. Simply adjust the units external compression bolts until the desired new setting is reached. It works on a spring loaded convex pins with detents which reacts to overloads. Unlike friction-type designs, you can submerge an H-TLC in oil and still depend on precise disengagement at your design limits.